Demonstrators are arrested by police during an act of civil disobedience Aug. 10, 2015, on West Florissant Avenue in Ferguson, Mo. "Reporters from The Huffington Post and Washington Post have been charged with trespassing and interfering with a police officer's performance, a chilling setback for press freedom coming nearly a year after their arrests in Ferguson, Missouri," Michael Calderone reported Monday for the Huffington Post. "The Huffington Post's Ryan J. Reilly and Washington Post's Wesley Lowery were arrested while working out of a McDonald's on Aug. 13, 2014, just four days after white police officer Darren Wilson shot and killed unarmed black teenager Michael Brown. "Police claimed the journalists, who were covering the unrest that followed the police killing, didn't leave the restaurant fast enough. Reilly described a police officer shoving his head against glass during his arrest, while Lowery said an officer pushed him into a soda machine. Both Lowery and Reilly were quickly released and not charged with any crime at the time. "The decision to charge Reilly and Lowery now is especially surprising, given that St. Louis County settled just last week with two other journalists arrested while reporting in Ferguson. "Until recently, Reilly and Lowery believed their incidents with police were long over with. The Huffington Post reported last month that the St. Louis County Police Department filed incident reports in late April describing the two reporters as trespassing in the McDonald's. Police referred their cases to the St. Louis County counselor's office, which, given a one-year statute of limitations, had until Thursday to bring charges. "Lowery was notified Monday of the charges against him. Reilly has not yet received notification, but a spokesman for the St. Louis County executive confirmed he will face the same charges. . . ."
The Huffington Post and Washington Post condemned the charges, as did the National Association of Black Journalists and Unity: Journalists for Diversity. NABJ said in a statement, "The organization believes Lowery acted reasonably in pursuit of news and information needed by the public in the aftermath of the shooting death of Brown and in light of ensuing unrest in Ferguson. "The initial decision to release Lowery without filing charges also suggests that authorities themselves believed that his initial arrest could have been an abuse of power and discretion. The organization encourages local officials to drop the charges filed against Lowery so journalists can operate without fear that doing their jobs will lead to them being jailed. . . ." Lowery is a former NABJ board member. Unity President Russell Contreras said in a separate statement, "These charges are bogus. Wes Lowery was in a public place and working in a professional manner when authorities detained him for no reason last year in Ferguson. "This is an abuse of police power and an attack on the free press. These charges should be dropped immediately. We stand with NABJ and The Washington Post in expressing our concern over this disturbing action." 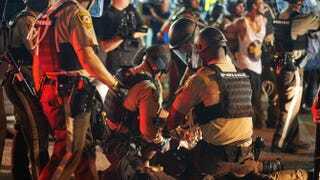 Abby Phillip, Mark Berman and William Wan, Washington Post: In Ferguson, a state of emergency. And frustration. Virgil Smith, vice president for diversity at the Gannett Co., the nation's largest newspaper company, is retiring from his post effective Sept. 30, leaving at a time when Gannett has lost its reputation as the leading news company for racial diversity. "Diversity continues to be a challenge for media companies, specifically for hiring and promoting senior level executives and editors of color," Smith told Journal-isms in an email on Monday. In June, Gannett split into two companies, spinning off its publishing business. Tegna, which continues to be based in McLean, Va., owns or provides services to 46 TV stations nationwide and runs cars.com and careerbuilder.com. "The spun-off publishing company, which adopts the name Gannett, owns newspapers in 92 markets, including USA TODAY, and plans to acquire more papers and other media assets," Roger Yu reported in June for USA Today. As things now stand, no African Americans will be in senior leadership in Gannett or Tegna after Smith's departure. Jeremy Gaines, who led corporate communications for the former Gannett Co., referred questions about the new Gannett's diversity posture to Amber Allman, who heads communications for the new Gannett. She did not respond. Speaking as vice president/corporate communications for Tegna, Gaines said a Diversity Council would assume Smith's role there. He said by email, "Ensuring the continued diversity of our employee population at all levels remains critically important to TEGNA. Diversity efforts will be managed by our Diversity Council, made up of senior-level leaders from across the company, which is actively working to build on our strong track record." Asked for specifics about what the council would be doing, Gaines said, "The group focuses on employee recruitment and development as well as content and programming." Under the late Al Neuharth, Gannett was considered the leading news company for diversity. It vied with the now-defunct Knight Ridder Co., which adopted as a slogan, "Diversity. No Excuses." The most recent list of top African American newspaper managers compiled in August 2013 for the National Association of Black Journalists by Don Hudson, executive editor of the Decatur (Ala.) Daily, included five black publishers, one senior vice president-publishing and one vice president-content in the mainstream newspaper business. None of the seven was at a Gannett property. In October 2013, Gannett named Susan D. Leath, who is African American, president and publisher of The News Journal Media Group. It publishes the News Journal in Wilmington, Del. Smith turns 65 in December. He also said by email, "A joy of my career has been and continues to be helping professionals develop and grow in their careers. It has been a great experience and I plan to continue the work of helping others in the next phase of my life as a coach and consultant. Finally, I am thankful for all the wonderful people who have enriched my life during my 44 year career. " "There was a greater percentage of black people in the audience (mostly conventioneers) than at probably any previous Twin Cities performance by Prince," Jon Bream wrote Sunday for the Star Tribune in Minneapolis. Bream was writing about attendance at Prince's Paisley Park studio complex outside Minneapolis Saturday night, where 650 members of the National Association of Black Journalists accepted an invitation from the rock star to pay $20 apiece in hopes of seeing the entertainer himself. An additional 227 people paid $50 for the privilege. Prince did not perform, but he did give an interview to a 10-member delegation from NABJ and spoke for about two minutes to the crowd to plug his new music venture with Jay Z. "It was a very unusual night at Prince's Paisley Park studios on Saturday," Bream's report began. "Not because he talked to the crowd but did not perform. "Not because he spent 45 minutes huddled with 10 handpicked media members who were attending the National Association of Black Journalists convention in Minneapolis. "Not because there was a greater percentage of black people in the audience (mostly conventioneers) than at probably any previous Twin Cities performance by Prince. "Not because people actually took verboten cellphone photos inside Paisley Park and no security guard escorted them out. "Not because Paisley Park seemed unnecessarily warm with nearly 900 bodies dancing. "Not because dance-party goers had a chance to play ping-pong and pool in Paisley's soundstage. "No, the most extraordinary thing about Saturday was that precious little Prince music was played. During the four-hour dance party, DJ Kiss, brought in from New York, offered about 2½ Prince songs. . . ."
Hennepin County, which includes Minneapolis, was about 12.4 percent black or African American in 2013, according to the U.S. census. That number was less than the number of foreign-born persons, 12.9 percent. Kelley L. Carter, BuzzFeed: Prince: Record Contracts Are "Slavery"
Investigative journalist Nikole Hannah-Jones accepted her award as the National Association of Black Journalists' "Journalist of the Year" Saturday night in Minneapolis with a rousing call for black journalists to follow their passions and tell the stories of African Americans. Hannah-Jones told the crowd, "Four years ago, I was told I was writing about black people too much. I was punished for that." She said she did not believe the narratives about why black people worked menial jobs as they traveled northward. "I knew the narratives were not true. We came up here for a better life." Hannah-Jones also said, "Four years ago, it broke my heart" when she was told she was writing too much about African Americans. It hurt so much, she said, that she thought about leaving the profession. Fortunately, she added, Stephen Engelberg, ProPublica editor-in-chief, "saved me" with a job offer and "allowed me to do what I wanted to do. So many assignment editors do not allow us to tell the stories we have. Let us tell our stories." Peter Bhatia, then editor of the Oregonian, where Hannah-Jones worked four years ago, messaged in response to a query from Journal-isms, "Nikole is a fine reporter and we were sorry to see her leave The Oregonian, though the opportunity at ProPublica was a great [opportunity.] If that was said to her I would expect it was in the context of diversifying her work to take advantage of her skills." Hannah-Jones won the Journalist of the Year award "for her body of work about the continuing segregation of America's schools. The stories — which she wrote for ProPublica — offer a critical exploration of access to opportunity and educational equity," according to the awards program. "Hannah-Jones, who recently was hired by The New York Times Magazine, also has written extensively about housing discrimination and the ongoing litigation of affirmative action, including recent Supreme Court cases such as Fisher v. University of Texas. . . . "
The award winner told the audience, "I'm tired of hearing the same excuses that the talent is not there. The talent is in this room. We are here. . . . I write for us, I write our stories and I push back. I say push back, keep making them uncomfortable, because that is what I plan to do." She quoted a song title from James Brown, the late Godfather of Soul: "I Don't Want Nobody to Give Me Nothing (Open Up the Door, I'll Get It Myself)." Brittany Noble-Jones, who reported the Ferguson, Mo., story last year as a general assignment reporter at KMOV-TV in St. Louis, told the National Association of Black Journalists Saturday that her experience with the story has persuaded her that "It's time to take diversity to the next level. It's time to have black leadership in our newsrooms." Last month, the Radio Television Digital News Association's latest RTDNA/Hofstra University Annual Survey reported, "After three years of growth in 2009, 2010 and 2011, the percentage of minority news directors at non-Hispanic stations fell for the fourth year in a row. Three years ago, 10.7% of TV news directors at non-Hispanic stations were minorities; two years ago that dropped to 9.5%; last year it fell to 8.6%; this year, it's down to 8.3%. "Half (4.2%) of those were African American — about the same as last year . . ."
Noble-Jones, who was named NABJ's "Emerging Journalist of the Year," "was one of the first journalists to cover the aftermath of the fatal police shooting of Michael Brown in Ferguson, Mo.," according to the awards program. "Her interview with Brown's mother shortly after his death — using the app Instagram — trended worldwide. "Noble-Jones' use of social media to immediately tell the story, rather than wait until her newscast aired, was noteworthy. She also used social media to find potential witnesses, [whom] she later interviewed. . . ."
As the Ferguson story unfolded, Noble-Jones' schedule was changed, she told the audience. "I felt it never would have happened if I had [the presence] of our 44 founders [in newsroom leadership]. They believed that black lives matter." Asked why Noble-Jones was pulled off the story, Brian Thouvenot, KMOV-TV news director, told Journal-isms by email on Monday, "Brittany Noble-Jones did some outstanding work at KMOV and we wish her the best success in her new anchor position in Jackson, Mississippi. We were very sorry to see her leave KMOV and worked very hard to keep her at the station. KMOV does not comment on employment issues." Noble-Jones told Journal-isms that family connections helped her get the story, one in which "I felt I had the weight of the entire black community on my back. "My family involvement with news sources actually helped us in coverage," she messaged. "For example, Mike Brown's funeral was held at the church where my father in-law is pastor. Because of that we were able to set up with the networks instead of being held back like other local news stations." Referring to Dorian Johnson, the friend with whom Brown was walking when they were stopped for jaywalking by Officer Darren Wilson, who shot Brown, Noble-Jones continued, "Also I have ties to Dorian [Johnson's] brother Demonte. That helped us land an exclusive jail house interview when they were both arrested for allegedly having drugs but charges later dropped because police couldn't find anything." Noble-Jones dedicated her award to Brown and his family a day before the one-year anniversary of his shooting death. She also closed a tweet with the hashtag, "BlackJournalistsMatter." Democratic presidential candidate Martin O’Malley, the former Baltimore mayor and Maryland governor, drove from Iowa to Minneapolis to speak Saturday at the convention of the National Association of Black Journalists. But few knew about it, and he drew an audience of about 10 people. Last month, O'Malley and Sen. Bernie Sanders, I-Vt., another Democratic presidential candidate, were caught unprepared at a Netroots Nation conference in Phoenix. "The two presidential candidates found themselves at the center of the chaos, both caught off guard and unable to answer the protestors" from Black Lives Matter, Sam Frizell reported then for Time.
" 'Black lives matter. White lives matter. All lives matter,' O’Malley said to boos and jeers. . . ."
O'Malley acknowledged in his NABJ appearance, "I was wrong to separate the concerns of those who feel they are under siege. 'Black lives do matter,' " according to Charles Robinson, a political reporter for Maryland Public Television and an NABJ member who arranged for O'Malley's appearance. The former governor also defended the zero-tolerance policing measures he implemented during his mayoral tenure, saying, "We wanted to get rid of the 24-hour drug markets that were squeezing neighborhoods." O'Malley said in hindsight he would do it again, Robinson reported. John Fritze and Doug Donovan reported in April for the Baltimore Sun, "In 2005, the Police Department made more than 100,000 arrests in a city of 640,000 people. The following year, the NAACP and the ACLU sued the city on behalf of 14 people, alleging that their arrests indicated a broad pattern of abuse in which thousands of people were routinely arrested without probable cause. "The city settled the lawsuit in 2010 for $870,000, agreed to retrain officers and publicly rejected zero-tolerance policing. O'Malley's supporters have long noted that his crime strategy has been subjected to three elections in which he received overwhelming support in African-American communities often affected by zero-tolerance policing. . . ."
O'Malley was the only presidential candidate at the Minneapolis convention. Robinson said most Republican hopefuls indicated that they were too busy preparing for Thursday's Fox News Channel debate. Dr. Ben Carson's public relations spokeswoman said that Wednesday, before most of the journalists had arrived, was the only day available for Carson, Robinson added. The Hillary Clinton campaign was also contacted, he said.